Developmental monitoring observes how your child grows and changes over time and whether your child meets the typical developmental milestones in playing, learning, speaking, behaving, and moving. 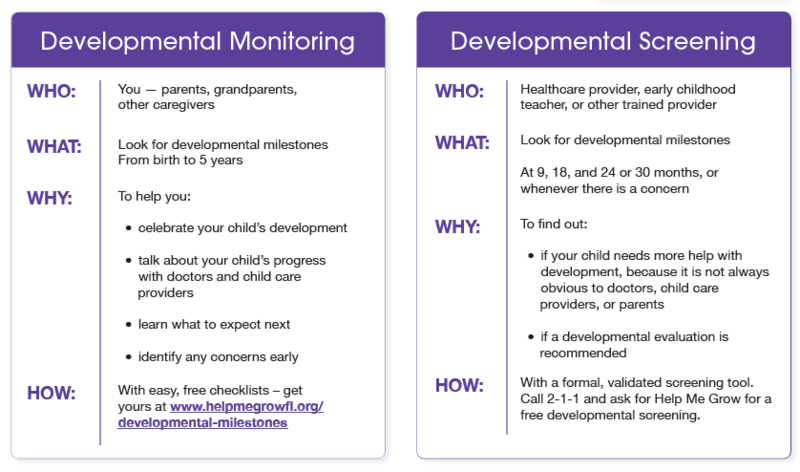 Parents, grandparents, early childhood providers, and other caregivers can participate in developmental monitoring. You can use a brief checklist of milestones to see how your child is developing. If you notice that your child is not meeting milestones, talk with your doctor or nurse about your concerns and call 2-1-1 for more information and a free developmental screening. When you take your child to a well visit, your doctor or nurse will also do developmental monitoring. The doctor or nurse might ask you questions about your child’s development or will talk and play with your child to see if he or she is developing and meeting milestones. A missed milestone could be a sign of a problem, so the doctor or another specialist will take a closer look by using a more thorough test or exam. Your childcare provider can also be a valuable source of information on how your child develops. Developmental screening takes a closer look at how your child is developing. It is a snapshot of a child’s development at a single point in time. The tools used for developmental and behavioral screening are formal questionnaires or checklists based on research that ask questions about a child’s development, including language, movement, thinking, behavior, and emotions. Developmental screening can be done by a doctor or nurse, but also by other child or health professionals. Help Me Grow Florida provides free developmental screenings for children birth to age 8 and can be accessed by calling 2-1-1 for Help Me Grow. Developmental screening is more formal than developmental monitoring and normally done less often than developmental monitoring. Your child should be screened if you or your doctor have a concern and at regular intervals as the child grows.